TCM believes that nuts are warm and hot in nature. The cold weather makes it suitable for people to eat nuts in winter without getting internal heat. Most nuts can nourish and strengthen kidneys, brain, and heart. In addition, eating nuts in winter helps keep warm and improve physical quality. Walnuts are high in protein, fat, minerals, and vitamins. The rich vitamin B and E help prevent cell aging, enhance memory, and slow down aging. Besides, walnuts can reduce the intestinal absorption of cholesterol, beautify skin and hair. TCM believes that walnut is an important adjuvant material for Chinese patent medicines. 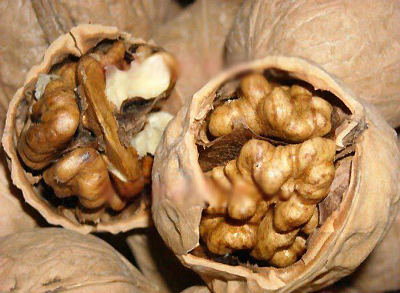 Walnuts have very good effects on kidney deficiency, urinary frequency, and cough. They also help relieve fatigue and stress. Walnuts are beneficial for all people. Better eat 20 grams daily. Overconsumption of walnuts will affect digestion. Do not peel off the brown skin of the walnut kernel, or it will cause nutrition loss.